I do not consider myself to be a “food snob” but there are certain things that are either right or wrong when it comes to the kitchen and food preparation. Sure, bastardized versions of many dishes have been made popular over the years to appease the increasing number of dietary restrictions, but there is one thing that I find offensive if it is messed with and that is spaghetti. One of my dear friends shared a story with me (mainly because he knew I would lose sleep over it) about “the incident” that may haunt me for the rest of my days. We are both twirlers. We take great pride in reaching into that steaming bowl of pasta with a fork and twirling that spaghetti, either on a spoon or in the bowl, until a pleasing mound of pasta is gathered in a beautiful spiral pattern. There is something very fulfilling about the twirling process and the effort to twirl makes the reward of the first bite that much better. It was a day like any other. He had been out working in his shop and could almost smell the pungent aromas of tomatoes and spices wafting through the air. As he neared the house, the scent of the sauce was accompanied by the fragrance of a fresh baguette, lathered in garlic butter, toasting in the oven. What promised to be a meal fit for a King turned into a meal fit for a toddler. I can only imagine the amount of time that elapsed while he gaped at the bowl in front of him, trying to be appreciative of her efforts but not commenting aloud about the egregious choice she had made. She had sacrificed everything that is good about spaghetti and had broken the noodles into bite-size pieces. He felt the harness tightening, encasing him in the invisible high chair in which he now felt trapped. He repressed the urge to turn into that toddler and throw the bowl to the floor while he struggled to come to terms with the embarrassment those noodles must have felt. He suffered in silence along with them as he spooned the unrecognizable pasta into his mouth. Years later, I now suffer, not so much in silence, with him. A law of nature was twisted that day – the day the spaghetti broke. Funny thing, I HATE spaghetti! But I loved this post. No!! He must tell her. He’s going to live his life full of broken spaghetti? The other option is to cook for her one night with proper spaghetti and she might get that this is his preference. The first time my husband cooked for me the pasta was not cooked. It was CRUNCHY, basically inedible. I thanked him profusely for cooking me a meal, promised to teach him how to cook pasta, then went and made us toasted cheese sandwiches. They have since ended their relationship (for unrelated reasons!). I had a friend who defiled pasta in this manner, cutting it with a knife rather than twirling. I knew in that moment that our friendship would never again be what it once was. You just can’t unsee that. I feel your pain – it’s sacreligious! You’re right. God would never cut His spaghetti. From someone who finds twirling spaghetti over a spoon unacceptable, this is beyond comprehension (not to mention it is even harder to eat that way). 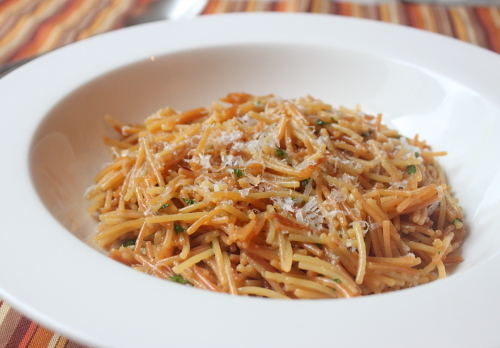 I tend to twirl in my bowl….but I can’t even imagine being served a truncated version of spaghetti.